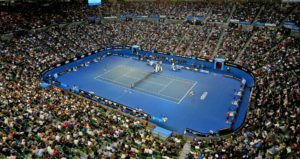 The Grand Slam season begins at the Australian Open, where fans from across the globe come for stellar tennis and a laid-back atmosphere in Melbourne. Of late, the Grand Slam of Asia/Pacific has been a playground for the Big Four, with either Novak Djokovic (6; 2008, ’11-’13, ’15-’16), Roger Federer (6; 2004, ’06-’07, ’10, ’17-’18) and Rafael Nadal (2009) having won all but two of the Australian Open titles since 2004. Russian Marat Safin (2005) and Swiss Stan Wawrinka (2014) broke the streak. Brit Andy Murray has finished runner-up a record five times. In 2019, the tournament will be held from 14-27 January.